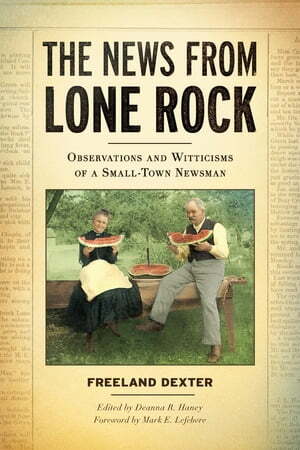 Collins Booksellers - The News from Lone Rock by Freeland Dexter, 9780870207709. Buy this book online. At the turn of the twentieth century, the bustling railroad town of Lone Rock, Wisconsin, was home to about a thousand residents, and Freeland Dexter seemed to know the business of every single one. Dexter reported all the news from Lone Rock—from the significant to the trivial, the tragic to the comical—for the Weekly Home News of neighboring Spring Green from 1884 to 1912. This collection of Dexter’s most fascinating, amusing, and poignant stories and observations brings back to life the colorful characters of his time and takes readers on a journey to a world that was both simpler and changing fast. Whether he was reporting who grew the biggest watermelon, teasing the local lovebirds, or taking a side on the ever-controversial question of whether the town should go dry, Dexter wrote with a distinctive wit and an obvious affection for his town and its people. The News from Lone Rock also provides an illuminating window into a time period of rapid technological progress, showing how the introduction of electric light, telephones, and cars changed lives and connected this quaint village more and more to the outside world.